Deep snowpacks, rugged Northern beauty, bonfires under the northern lights, cozy tiny home accommodations, outdoor barbecues, five star meals, world famous location, massive ski tenure with short flight times, and endless smiles every day. Yukon Heli has all of these to offer and more. We're located in the Yukon Territory, but border on BC and Alaska, which means we are treated to one of the best snowpacks and heli ski tenures that the world has to offer. With multiple lifetimes of Yukon knowledge, and decades of experience guiding, our team is honoured to serve the needs of clients from all around the world. We've accommodated everyone from locals, to international ski tourists, to professional film crews. The landscape that our tenure lies in is awash in the histories of rugged exploration, gold rushes, and cultural significance. With operations based out of a seasonal tiny town on a highway pass, we are uniquely poised to offer immediate access to all variations and levels of terrain, plus a rustic, yet homely and welcoming environment and camp lifestyle. Canada's Northern Territories are world famous for having some of the best aurora displays on this planet. On clear nights, the celestial skies are awash with billions of stars, and often the spectacular dance of the Northern Lights fills the entire sky, horizon to horizon, glowing above the cozy cabins below. Some of our more challenging terrain includes awe inspiring ski features such as pillow walls running down mountain spines. Challenging ski lines may be available on request to experts. From tiny town basecamp, it is only a few minutes of flying to get to the top of your first run. This means that you can enjoy greater vertical than typical heli ski operations. At the end of the day, ski right back to your tiny house doorstep, and the comfort of a warm sauna and hearty meal. Every night, feel cozy in the comfort of a custom built tiny house. Just steps from the saloon and helipad, its a perfect base for the day's activities. Yukon Heli operates in the Northern Coast Mountains of BC and Yukon Territory. This means that we get lots of snow to play in, while still keeping the cool temperatures needed for light powder skiing. Our tenure is extremely large, and includes all kinds of terrain; from steep spine lines used by expert film crews, to long fun powder slopes, and everything in between for skiers looking to enjoy the snow or challenge themselves. Activity in tiny town is based around the central saloon. With a full kitchen, wood fire, and large dining area, it's fit to serve as a friendly hangout spot, eating area, and group forum. Not to mention delicious meals catered by professional chefs. Clients stay in charming and comfortable, yet rustic tiny homes. Each comes complete with beds, shower, electricity, propane and wood stoves, and a small kitchenette. No proper ski chalet is complete without a sauna. At the Haines pass tiny town, a wood fired sauna on wheels provides rest and relaxation for guests after they are finished with their days. Every season, an extraordinary amount of effort comes out of a small team dedicated to creating this magical ski paradise. Every tiny house, RV trailer, amenity, and vehicle must be driven from Whitehorse. At the pass, an excavator helps clear the tiny house site with the help of a highway maintenance snowblower. The tiny houses and saloon are winched to the top of a hill, providing incredible panoramic views of the skiable terrain nearby. At highway level are the washroom, sauna, equipment trailer, and guides accommodation. Pete was born in Whitehorse, Yukon and raised in the Atlin, BC area and surrounding mountains. Pete's father, Arnold Edzerza ran a guiding business in Atlin for 40 years. Pete was adopted by the Etzenlee clan as a small child, and grew up with the First Nations Tahltan family. In 1998 he began heliskiing with CMH (Cariboo Mountain Holiday) in the Cariboo mountains working in the Cariboo Lodge in Valemount, BC. Pete is a CSIA ski instructor, Canadian Wilderness First Aid advanced certificate holder, level one Canadian ski guide (CSGA), with Canada Avalanche Association training, plus CAA and CSGA advanced crevasse rescue training. Over the years he has done many expeditions in the Atlin mountains, crossing the Juneau ice cap to the Pacific from Atlin, leading Ski Mountaineering Expeditions on the St. Elias range and Mount Logan among others in the Yukon mountains. During the summer months Pete owns and operates a gold mine in the Cariboo Goldfields near Barkerville, BC. His hobbies are mountaineering and ice climbing (Africa, Himalayas, Canada and Europe), and rock climbing (USA, Canada, Mexico and Thailand). Shayne is a certified snowboard instructor with CASI, and CSGA level 1, plus holds a full Wilderness Advanced First Aid and Extended Care Certificate. . He has worked the last 4 seasons with Pete Wright at Yukon Heliski exploring their new tenure, selecting runs and monitoring snowpack. Shane studies the snowpack from the first snowfall of the season to the very last. Michael is a IFMGA (UIAGM) mountain guide and level 4 ski instructor and has 20 years+ experience in heliskiing in several roles as guide, manager and owner. As a good friend of Pete Wright, he was part of Yukon Heliski since the founding days. His life is dedicated to skiing and when he is not running his own business he is either in the helicopter or coaching his son in ski racing. We take our wildlife avoidance programs very seriously and spend a considerable amount of time and expense on mapping, ground truthing, and flight path avoidance in areas of high winter ungulate habitat. We employ a leading Yukon biology firm to do our goat study and mapping programs so our guides can learn how to avoid these animals in their prime winter habitat. Its fortunate for us that goats simply do not like the same terrain that we use for heliskiing. Our helicopters have iPads installed in each machine and we use a custom made, advanced mapping program for helicopter flight path avoidance of certain high value winter goat range within our territory. We share this information with local First Nations offices and mapping their lands and game managers. We also use full time flight tracking systems in our machines and at base office in Whitehorse to allow a environment official or Conservation officer to view our daily flight plans to make sure our pilots are adhering to the flight plans allowed to us by the Ministry of Environment. Goats, if sighted in our ski tenure, are talked about in our daily guides meetings and noted on our daily logs. These animals have more right in this area than we do playing on skis, so we take our goat management very seriously. In the spring of 2016, a crew of highly trained athletes and filmmakers was guided by Yukon Heliski on an expedition to the fabled spine lines 'Corrugated"; just over the Alaskan Border from our usual tenure. This BBC production was guided over the Chilkoot Pass and across the mountains on a journey North to the Yukon. Of other note are the locations of cultural and historical significance visited on this journey. Two RedBull athletes; a skier and snowboarder, make the pilgrimage to Yukon Heliski and the area to find and conquer steep spine walls, tight chutes, and pow covered mountain faces. Filmed spring 2017. 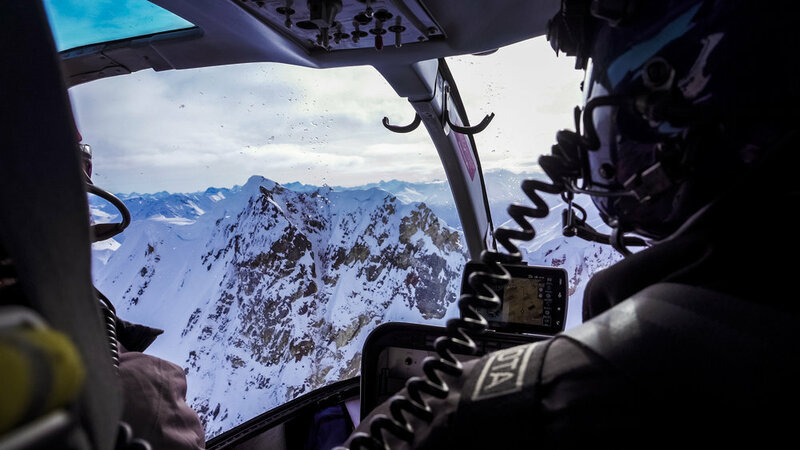 A photo slideshow showing scenes from standard ski packages with Yukon Heliski. $88,000 all inclusive/week. Full private group. 2 guides. A-star. Nine hours heli time. Group of 1-4 skiers. $2600/hour for extra heli-time. FULL PRIVATE CAMP. All packages based on flying time, not vertical feet. With immediate access to world class ski terrain, vertical per flight hour will be on the high end as compared with other ski operations. $13,600 all inclusive/week/person. Two 4 person ski groups. A-star. 6 hours heli-time for group of 4. 12 hours heli time for group of 8. Camp accomodates maximum 8 people. All packages based on flying time, not vertical feet. With immediate access to world class ski terrain, vertical per flight hour will be on the high end as compared with other ski operations. Please contact us to make a booking request, or if you have any further questions about Yukon Heli.